The Sydney Cove plaque commemorates the bicentenary of the survivors of the Sydney Cove which was wrecked at the Furneax Islands in 1797. The survivors, in a long boat, were washed ashore near Tathra Headland and began an epic overland trek to Sydney. During February of 1797, the vessel Sydney Cove’ was wrecked at the Furneaux Islands in Bass Strait. On 27 February, seventeen of the survivors set off in the ship’s longboat towards Sydney for help. The longboat was washed ashore near Tathra, and the group, headed by the supercargo William Clarke and the first mate Hugh Thompson was forced to walk north along the coast towards Sydney. The party of 17 set out on March 15, and after a walk of almost two months during which period many died from exhaustion and starvation reached Wattamolla near Sydney on 15 May 1797. Of this group, only three survived the journey. This remarkable walk was the first known European exploration of the south eastern coast of Australia and marked the first contact between Aboriginals and Europeans in this area. 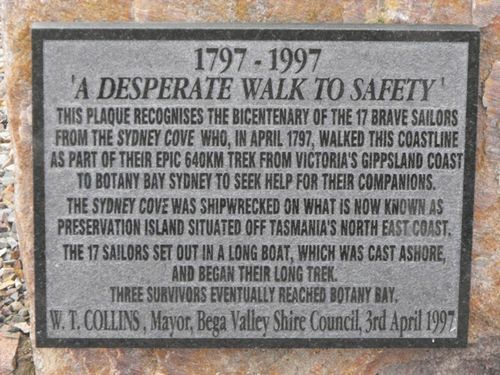 THIS PLAQUE RECOGNISES THE BICENTENARY OF THE 17 BRAVE SAILORS FROM SYDNEY COVE WHO, IN APRIL 1797, WALKED THIS COASTLINE AS PART OF THEIR EPIC 640KM TREK FROM VICTORIA'S GIPPSLAND COAST TO BOTANY BAY SYDNEY TO SEEK HELP FOR THEIR COMPANIONS. THE SYDNEY COVE AS SHIPWRECKED ON WHAT IS NOW KNOWN AS PRESERVATION ISLAND SITUATED OFF TASMANIA`S NORTH EAST COAST. THE 17 SAILORS SET OUT IN A LONG BOAT, WHICH WAS CAST ASHORE AND BEGAN THEIR LONG TREK. THREE SURVIVORS EVENTUALLY REACHED BOTANY BAY.